Opening image in Frontline article. 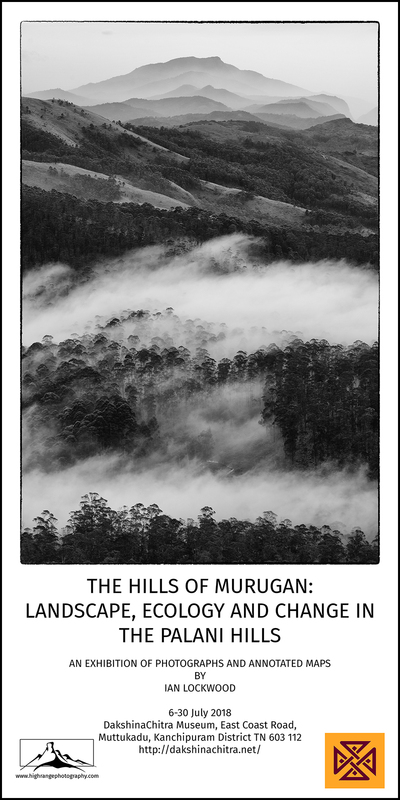 The image shows winter mist in eucalyptus plantations below Perumal Peak with remnant montane grasslands. In the last several months I have had the opportunity to have two important portfolios of black & white images published in prominent Indian publications. In September the Indian Quarterly published a photo essay on sholas in the Western Ghats entitled “Spirit Mountains.” This collection of images and a short text grew out of an online conversation with Suprarba Seshan who was looking for images to accompany her article “People of the Rain” article that appears the same issue. Her article went on to be illustrated Diba Siddiq who is also associated with the Gurukula Botanical Sanctuary, while I was allotted ten pages for the shola story. 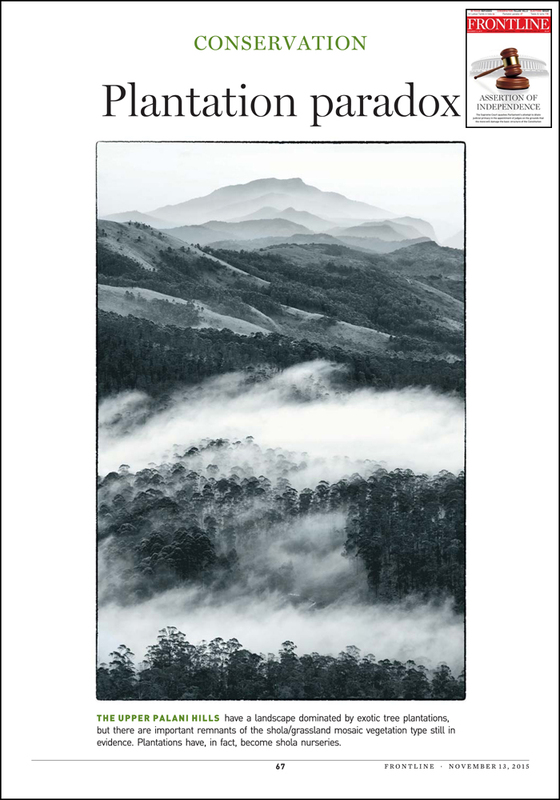 The issue is focused on rain and also includes a story about Agumbe by our prolific writer friend Janaki Lenin. Avtar Singh, the managing editor based in New Delhi, played a key role in pulling it all together. The images, all black & white, were chosen to illustrate the aesthetic themes of rain and diversity as seen in the sholas of the southern Western Ghats. 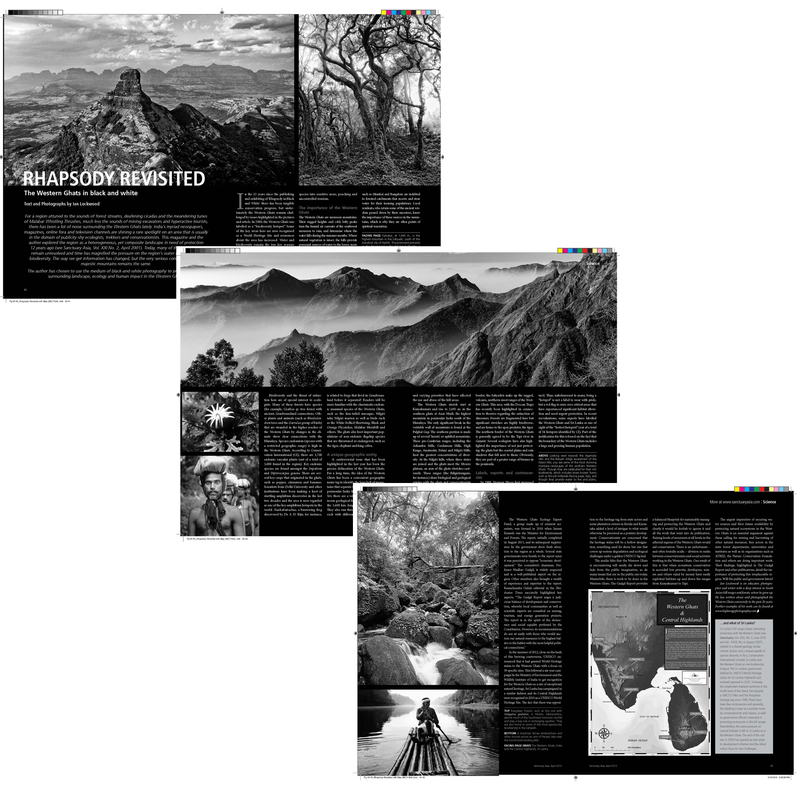 Some of the pages from the Indian Quarterly photo essay “Spirit Mountains.” Published in July 2015. This month Frontline has just published “Plantation Paradox” a photo essay accompanying my rambling exploration of the complications of non-native timber plantations in the Palani Hills. The Chennai-based magazine is part of the larger Hindu publications group-known for their reasoned, somewhat left-leaning reporting and support of secular, multicultural India. The pictures in this story are also all black & white and closely illustrate themes from the 3000+ word article. The article includes a version of the GIS-generated map (utilizing 30m SRTM USGS/NASA tiles) that I worked on earlier this year. It illustrates the 1,500m contour (shola/grassland areas) in the southern Western Ghats. Vijayasankar Ramachandran, the editor at Frontline was my contact who made this publication possible. We have worked together on several past articles that explored themes of conservation and ecology in the Western Ghats and Sri Lanka. In particular several of my Frontline articles have focused on issues in Kodaikanal and the Palani Hills where changes in the ecology, pressure from tourism and ambiguity about the status of the conservation of remote hills has been in flux (see list & links below). * There used to be web links for these but my understanding is that they are not active anymore. Cover from Landforms of India book (published in July 2014). The image on the left is the view of the southern escarpment of the Palani Hills. Over the last few months I have been collaborating and contributing to several book projects that have given me a sense for the complexities of the design, layout, editing and printing of large coffee table books. It has been a healthy experience and moved me a few steps closer to getting my own projects on the Western Ghats and Sri Lanka off the ground. A handsome atlas that is hot off the press from Pragati Offset printers in Hyderabad is Landforms of India from Topomaps and Images. I was privileged to be able to contribute photographs as well as the text used in the introductory jacket flap of the book. 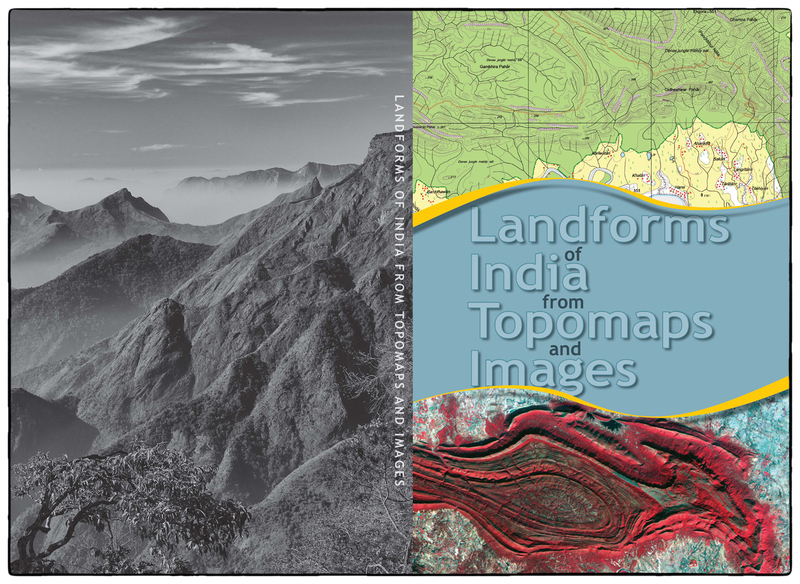 Landforms of India from Topomaps and Images is authored by Dr. R. Vaidyanadhan and Dr. K.V. Subbarao and is published by the Geological Society of India. It was supported by several key Indian agencies including the National Remote Sensing Centre, the Indian Space Research Organization (ISRO) and Geological Survey of India. It was by happy coincidence that the authors, both of who are eminent personalities in the world of geology and remote sensing, approached me to use some of my Western Ghats and NE India landscape work in their book. With the focus on education and helping students in schools and universities to better understand their country’s diverse physical geography, I was happy to get involved. 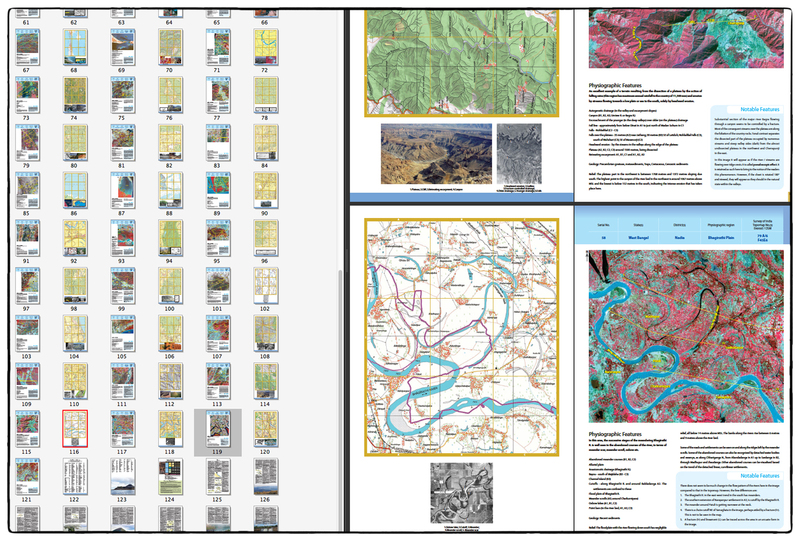 The Atlas is structured around 60 different sets of topographical maps (sourced from the Survey of India) that are aligned with remotely sensed images of the area and often include terrestrial photos of the same scene/or of similar features. They include a broad selection of examples of different features from all over the country (Jog falls in the Western Ghats, the Satpura Range, Himalaya, Khashi Hills, Brahmaputra etc.). 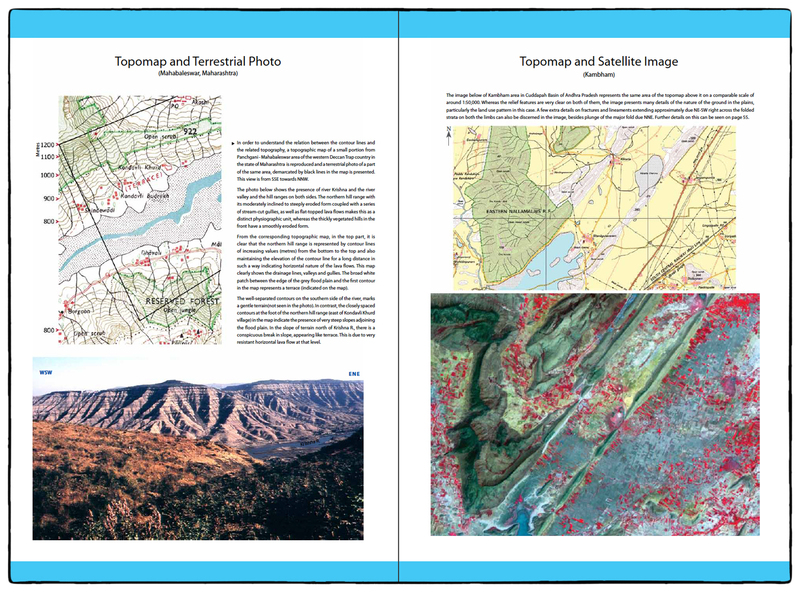 There is a clear introduction to broad themes (remote sensing, topographical maps, terrestrial photographs etc.) and nomenclature. At the end of the book a helpful glossary highlights key terms. Several large, two-page spreads highlight some of the key physical features of Indian’s diverse landscape. Landforms of India from Topomaps and Images was officially launched by the Geological Society of India on 25th July 2014 at the Sate Gallery of Fine Arts Hyderabad (I was unfortunately in transit back to Colombo from Madurai at the time). The atlas was released by Dr. Swarna Subba Rao, Surveyor General, SOI while the chief guest was Dr. Shailesh Nayak, Secretary to the Ministry of Earth Science. Over the last years my interest in India’s landscapes, and specifically those of the Western Ghats, has used remotely-sensed images (especially NASA/USGS Landsat) to better understand features (including land cover) as well as change. Combining these satellite images with detailed ground truthing and analysis has now become a key aspect of my interest in the Western Ghats (and Sri Lankan) landscapes. 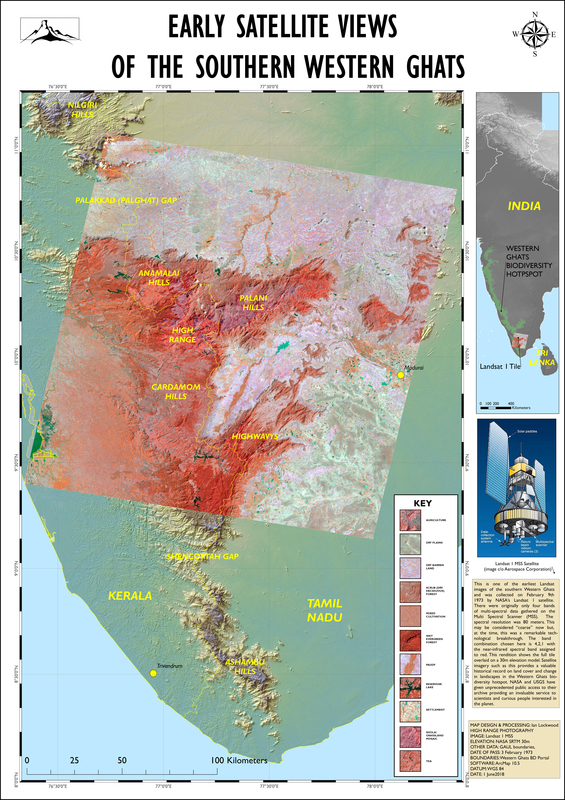 Though the Landforms Atlas doesn’t use the Landsat images or my studies it has a wealth of ISRO-collected imagery (usually stressing the thermal or infrared bands) combined with difficult-to-access SOI maps. Much of this remotely sense imagery of India is now freely available through the Bhuvan web portal. At the moment the best way to get a copy of the book is to order it using the following form. It should be available in major bookstores in India in the coming months. Cover images from the KIS Calendar 2014. The view is one looking south from Coaker’s Walk to the Vaigai Dam and Highwavy mountains. Taken in September 2013 on a short visit to Kodai. In the year of 2013 the challenges faced by small hill stations and communities in India’s Western Ghats continued to multiply. The double-edged sword of tourism and development has brought both prosperity and ecological upheaval to these fragile areas. They were originally settled for their beauty and salubrious climates, but today they are besieged by issues of noise, solid waste, water shortages, poor governance and other concerns of sustainability. Kodaikanal, located in the Palani Hills of Tamil Nadu, has unfortunately become a case study in uncontrolled growth and lackluster management. Record numbers of tourists continue to visit this south Indian hill station (160,000 in one particular ten day period according to the Hindu). In the heart of the township that hosts these growing numbers of tourists is Kodaikanal International School. In its 112th year KIS continues to offer a global education based on the International Baccalaureate curriculum for students from South Asia and beyond. There is a strong spiritual foundation for this learning; something that I like to see as an agglomeration of its Christian missionary roots, India’s mosaic of faiths and something special, quite indefinable in the air. As an alumnus who was shaped by experiences in the hills and school, I continue to stay involved with the school through its alumni association, Council of Directors and contact with friends who have given their professional lives to the school. 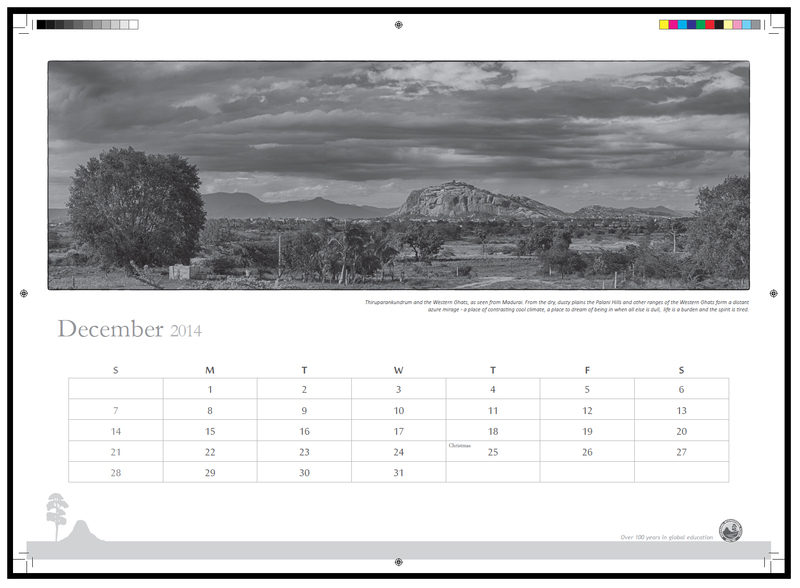 This year it has been my privilege to help contribute to the school’s annual calendar. After a few initial suggestions from my side, the calendar was designed by the intrepid KISCO team (Sonny Deenadayalan, Judy Redder, Billy and others). 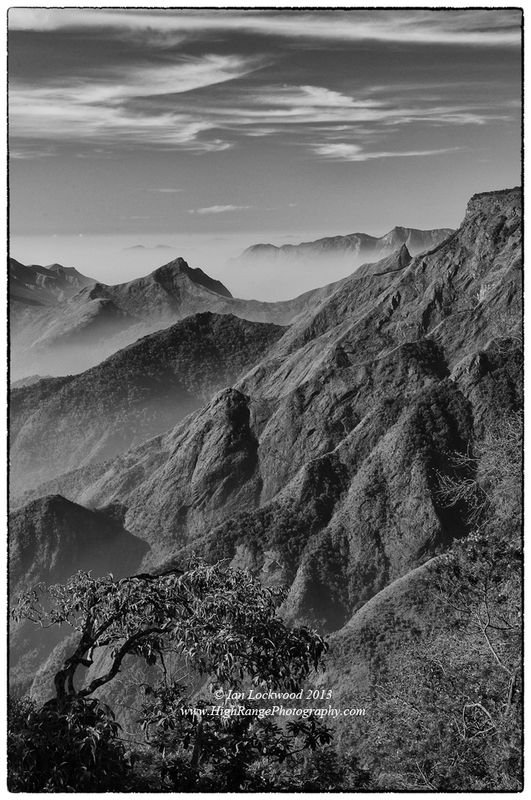 I selected 13 different black & white panoramic images that highlight important ecological themes in the Palani Hills. The images are all digital panoramas and owe their final presentation to DSLRs and software rather than the wet darkrooms where I used to spend so much time. 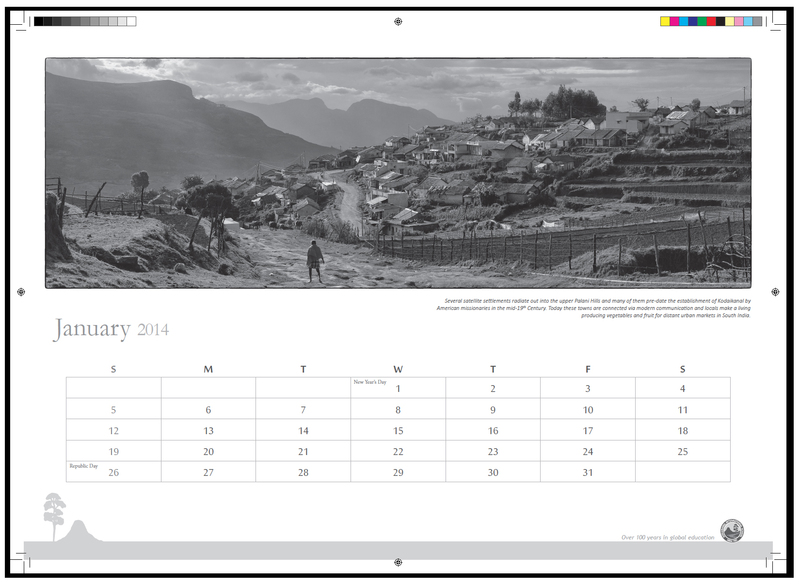 Calendars will be available from the KISCO office (located at the front gate of the school). I will also print a limited series of 40” long enlargements for spring art shows in Kodai and other locations. The Southern escarpment of the Palani Hills looking west to the Agamalai range and illustrating the varied vegetation and surprisingly rugged geography of these mountains. Last year there were significant milestones and steps taken to recognize and protect India’s Western Ghats. In July 2012 a handful of sites up and down the 16,000 km length Ghats area were given the UNESCO World Heritage Tag. Previous to this the release of the lengthy and comprehensive Gadgil report (made public first in late 2011) by eminent scientists had stirred a spectrum of responses to the proposals to protect the areas ecology and landscapes. The negative perception from some government agencies and vested interest was such that another report was commissioned (the Kasturirangan panel)! The Western Ghats encompass an enormous and diverse ecological area that I’ve been fortunate to be intimately associated with and the news elicited a more personal reflection on what the area has meant to me. My earliest memories are of walks and camping trips amongst clean, gurgling streams and cool sholas in the Palani Hills. Several years earlier, before my first memories and birthday, my parents had backpacked me through the rolling downs of the Brahmagiris on the Kerala/Karnataka border. As child and teenager growing up with an eclectic mix of American, Bengali, south Indian and global influences the mountains offered a unique opportunity for self-discovery, an appreciation of the interdependence nature and spiritual appreciation of the infinite. Since 1992, issues concerning ecology, landscape and human interaction in the Western Ghats have been the focus for my explorations, learning, photography and writing. These are passion pursuits that eventually became the focus of my life and teaching as I entered and became comfortable with a career in international education. In recent years my geographic focus has shifted to Sri Lanka’s Central Highlands, cousins of the Western Ghats in so many ways, yet I maintain a strong interest in developments across the straits. My response to the news and then the swirling controversy was to write something about it and this eventually found its ways into the pages of Sanctuary Asia, India’s preeminent wildlife magazine that was founded by Bittu Sahgal in the early 1980s. By the time the article came out this month (see screen shots below) the news was long forgotten but the issues of conservation, loss of biodiversity, water security, community rights and tourism development remain relevant and unresolved. Following the UNESCO designation of the Western Ghats a World Heritage Site in July 2012 there were a series of informative pieces published friends and colleagues in the Indian media. On July 3rd the Hindu ran an editorial that highlighted the UNESCO announcement. Subraba Sehsan emphasized the challenges of living up to the new limelight of the UNESCO World Heritage listing in her article in the Hindustan Times on July 8th. Janiki Lenin wrote about the Western Ghats controversy in Outlook Traveller with a rich selection of images from Kalyan Varma. Organizations such as ATREE, the Nature Conservation Foundation, the French Institute in Pondicherry and WWF-India continue the important work of addressing conservation challenges from a scientific point of view. Others in organizations, such as Kalpavirksh, work to promote environmental sustainability and ensure that communities are empowered to participate in conservation decisions. 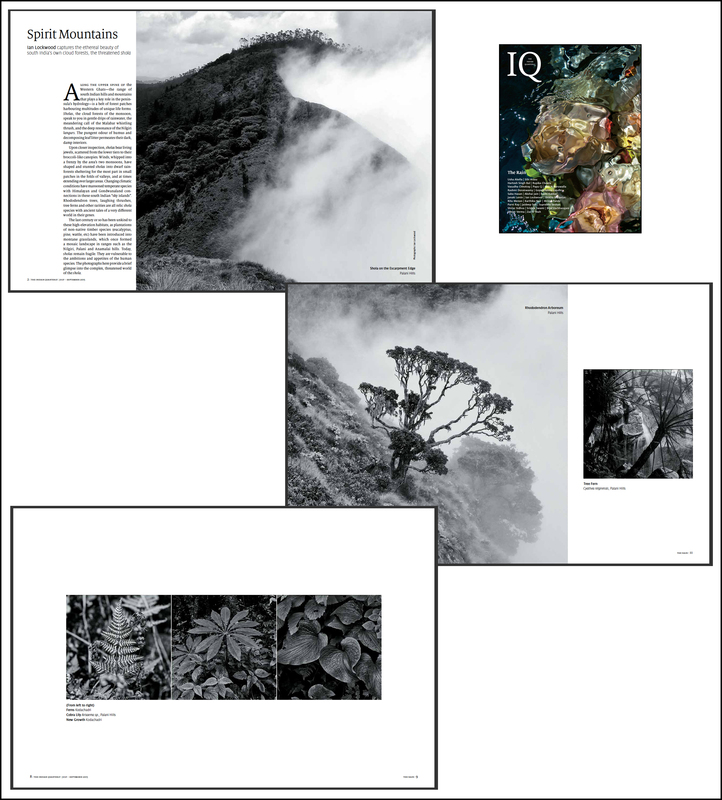 For a further exploration of my published work on the Western Ghats see the Published Work page on High Range Photography. In July 1994 I published my first significant photo-essay and article on the Western Ghats in the India Magazine (a publication that is now, sadly, defunct). I then spent several years researching, photographing and assembling pieces on the Nilgiri tahr, as an example of an endangered Western Ghats species. In 2001 I exhibited and gave lectures on the Western Ghats at the India International Centre and Bombay Natural History Society. In August 2003 I wrote about the Palani Hills in Frontline and advocated for a protected area to be designated in the range. The focus on the Palanis has been followed up with articles on ecological restoration in Sanctuary Asia (June 2006) and Frontline (April 2012). Both of these highlight the important work of the Vattakanal Conservation Trust in restoring native vegetation in the Palanis. For several years my wife Raina and I lived, worked and explored in the Sahyadris just outside of Pune. An account of this unique range of the (northern) Western Ghats was published in Sanctuary Asia (2005) and Man’s World (2004). Asian Geographic (2008) and Geo (2009) have also published my photo essays and articles on the Western Ghats, which give a sense of the whole range from a visual and descriptive point of view. ARKive has a dedicated page on the Western Ghats and I was honored that they have profiled several of my color images (by way of the Nature Picture Library). In all of these efforts, my goal has been to paint a picture of the landscapes in black & white to illustrate the stark magnificence of landscapes, varied vegetation types, human interaction and conservation. I use color imagery to highlight aspects of the biodiversity-one of the two main reasons that the Western Ghats are vital (the other being water). The field of photography has changed in these last 20 years and I continue to work on the same themes using a variation of the early approach but in the digital medium. In the last five years I have become intrigued with spatial aspects of the Western Ghats and Sri Lanka biodiversity hotspot and am using GIS to explore, analyze and understand the landscape and its changes. 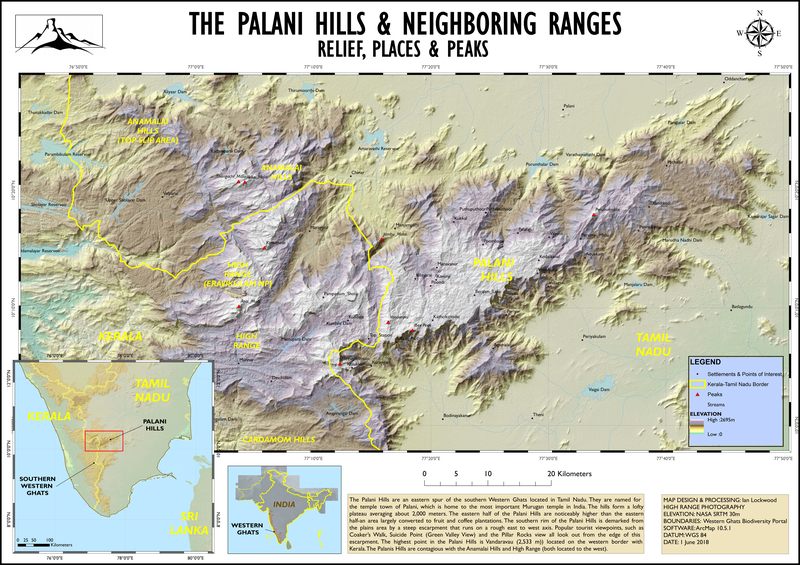 Just two weeks ago news emerged that the government of Tamil Nadu has designated the Palani (or Kodaikanal) Hills as one of four new protected areas in the state. This comes as welcome news, though it is yet to be seen what the exact boundaries are, how this will affect the significant human communities and activates (tourism, plantation agriculture etc.) and if restoration activities will be allowed within the protected area.